My previous post, Ontario is the sucker of first choice for off-price electricity, demonstrated an apparent growing opportunity for profit amongst the IESO market participants purchasing power at the IESO's depressed prices and selling into much higher priced exports markets. This post will discuss the multiple benefits bestowed in recent years on one of Ontario's most active exporters. 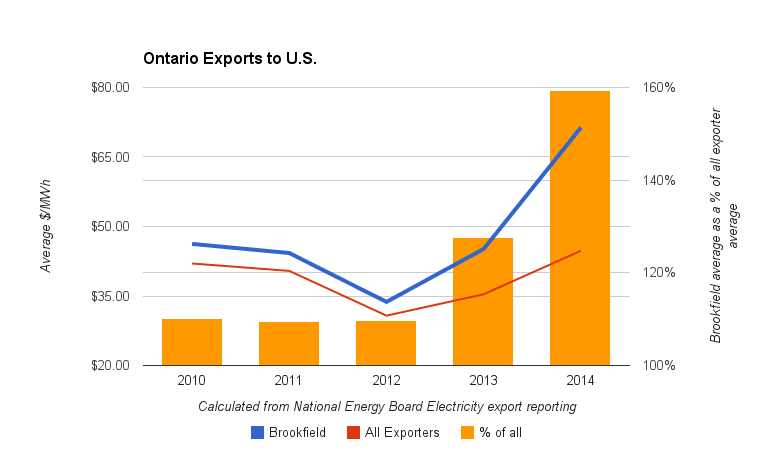 Brookfield looks to have had a particularly good year exporting in 2014, averaging $71/MWh while the average was $45. A couple of years ago Brookfield was beating the average by only about 10%, so this was an exceptional performance for this multi-faceted IESO stakeholder. The improved performance coincides with the introduction of renewable energy forecasts at the IESO, and market changes to structure the curtailment of wind and solar generators, which include Brookfield, when, as defined in the IESO rules, curtailment is necessary. Correlation is not necessarily causation, but it's also often not coincidence. It may be a good idea for the regulators Market Surveillance Panel to investigate whether any trading advantage might be presenting itself after the introduction of market rules allowing wind curtailmnet. Brookfield has had a run of good fortune, or great lobbying, in recent years. Shortly after Kathleen Wynne became Premier in 2013 an agreement was made to pay wind generators for curtailed supply whether or not their contracts specified doing so. The agreement stopped actions at the Ontario Energy Board launched by a group of renewable generators to challenge proprosed rules that would allow the curtailment of their output, presumably without compensation, when the grid could not accept it. The group of generators held power purchase contracts (RES) awarded prior to Ontario's introducing feed-in tariffs. Brookfield was one of the generators involved. The arguments made by the lawyers for these generators, and the Ontario Energy Board's legislated mandate/s, demonstrates the nature of the stakeholder curse for the common Ontario ratepayer. The Renewable Energy Supply Generators submit that the Renewable Access Amendments are inconsistent with the purposes of the EA and unjustly discriminate against Renewable Energy Supply Generators and in favour of the OPA. Fighting off economic curtailment of their industrial wind property outside of Sault Ste. Marie may not have been Brookfield's first time arguing they should be immune from the inability of the distribution system to move low value electricity from their isolated generators to distant demand. In 2011 they reported increases in contracts for hydroelectric generators from an average of $68 to $88 per MWh. 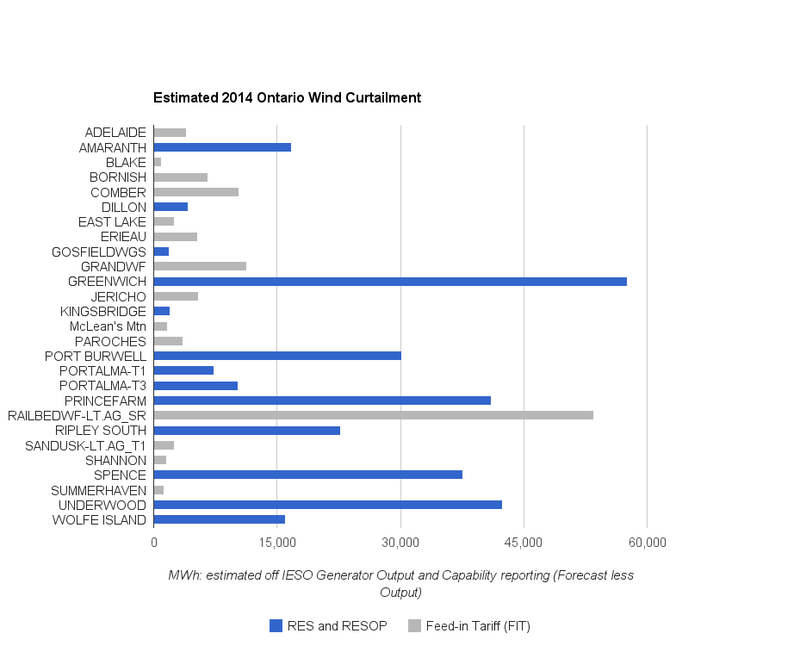 This despite Brookfield's generators being in the lowest priced sectors of Ontario's grid (explaining the Wind Farms more frequent curtailment). In the northwest zone, prices had, on average, been negative since 2008, and in the northeast zone prices remained far below the rates in the early years of the market. It seems it's good to be a stakeholder, but there's little evidence the IESO's stakeholder consultation models provides value to the typical ratepayer in the province. Renewable energy suppliers argue it is the role of the system to accommodate them, regardless of the market's valuation of their product - and the market does value their generation less than more reliable, more intelligently located generators. However, the renewable generators are not responsible for all of the rising expense in Ontario's electricity system. In pricing they are a convenient tool, or perhaps a knowing accomplice, of another stakeholder group driving costs disproportionately onto the functionally underrepresented smaller consumers in the province. 1. Brookfield is my shortened name for the entity in the National Energy Board data, which since 2010 has been, "Brookfield Energy Marketing Inc. and/et Brookfield Energy Marketing Inc. as General Partner on behalf of/en tant que commandité au nom de Brookfield Energy Marketing LP" - previously it was a simpler "Brookfield Energy Marketing Inc."
2. Renewable Integration (SE-91): "This stakeholder initiative will discuss design principles for forecasting, dispatch, visibility and future markets for wind and solar generation, as appropriate." On January 24, 2013, a number of entities that have renewable energy supply procurement contracts with the Ontario Power Authority (the “OPA”) in respect of wind generation facilities (the “Applicants”) collectively filed with the Ontario Energy Board an application under section 33(4) of the Electricity Act, 1998 (the “Electricity Act”) seeking the review of certain amendments to the market rules made by the Independent Electricity System Operator (the “IESO”) (the “Application”). The market rule amendments in question (the “Renewable Integration Amendments”) deal with the dispatching of, and the establishment of floor prices for, variable generation facilities, defined as all wind and solar photovoltaic resources with an installed capacity of 5MW or greater,1 or all wind and solar photovoltaic resources that are directly connected to the IESO-controlled grid. The Board assigned File Number EB-2013-0010/0029 to the application. 4. The IESO altered the Generator Output and Capability Report during 2014. For most of the year forecast would not show more than output, and it was assumed the forecasts were good enough to estimate curtailment. That seems to be true after a change to the report that allowed showing under-forecast hours. My queries will not lower the estimated curtailment, but the old data still appears to be useful, but slightly exaggerated. The IESO reported, "In 2014, wind reductions represented 4.6 per cent of total available wind production." If that referred only to the wind production they show (6.8 TWh), it implies 313 GWh of curtailment: my estimate was closer to 400 GWh.